If you are one of the 1000’s here from Pinterest, checkout a few of my other Beehive Builds. Just click here. I’ve used a lot of feeders but my favorite one is Don “The Fat Bee Man” Kuchenmeister’s Hive Top Feeder. They are really easy to build and make checking on your bees super convenient. However, I have made some slight modifications. In the first picture you can see the finished product. It is simply a 1×4 box with a #8 hardware cloth bottom. 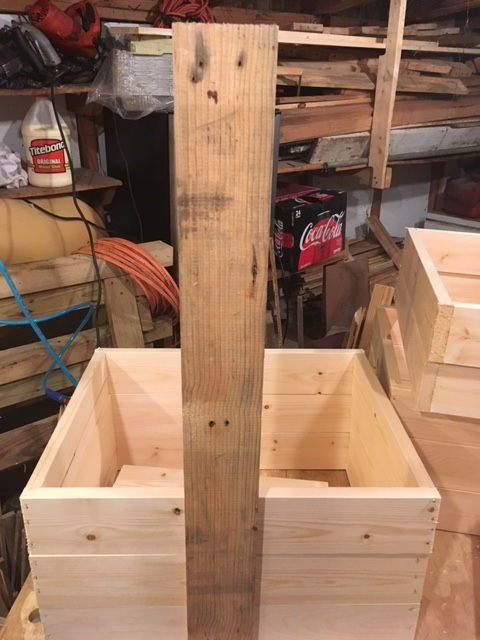 Before it goes in the hive, it will be lined with dryer sheets and then filled with cedar chips – hopefully this will keep out pest. Now before we get started, I cannot emphasis how helpful Jig’s are in the workshop. Because I already had a Jig built for cutting Supers out, I was able to cut up (15) 1×4’s in just 15 minutes. 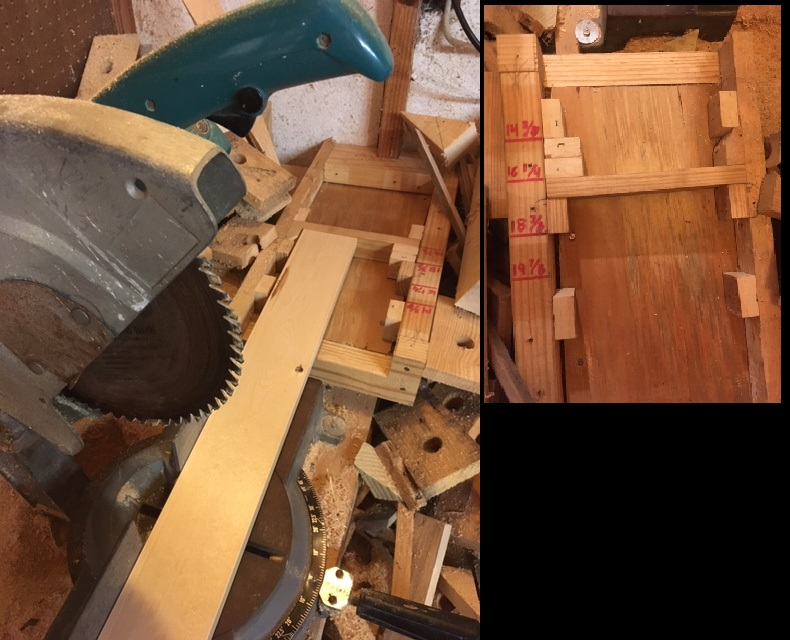 Later, as I began assembling my outer frames, I was struggling and losing time – until I tacked a board to two sides of one of the assembled boxes and used it as an assembly jig. In the same amount of time it took me to build two boxes without the Jig, I was able to assemble the other (13). Take the time to build your Jig’s – the time you spend building the Jig will pay dividends for years to come. 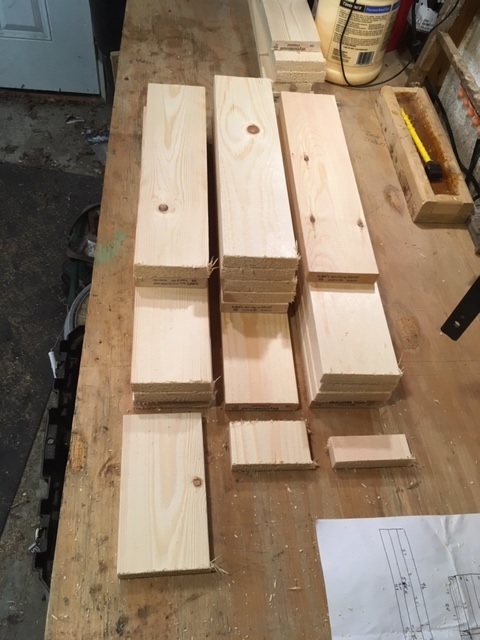 From (1) 8′ – 1×4, I can get (6) 14 3/4″ cuts. So (2) 19 7/8″ cuts plus (2) 14 3/4″ cuts make the outer box. Then the (2) 5 1/2″ scrap cuts are placed at one end with a gap in the middle. Then take the third and last 14 3/4″ cut and rip (2) 3/8″ pieces off long way. (1) strips will be used as a cross bar support for the screen. The other (1) will be cut into (4) even pieces at 22.5 degrees to create the enclosed ladder. Finally staple in place the #8 Hardware cloth across the bottom and trim off the excess. Then trim that remaining piece to 3″ wide. Now assemble the (4) ladder pieces two on each side and wrap with the hardware cloth leaving a 1/2″ exposed on the bottom side for an entrance. Place the ladder in the gap – making sure that there are no gaps that might allow the bees to enter the feeder outside of the ladder. 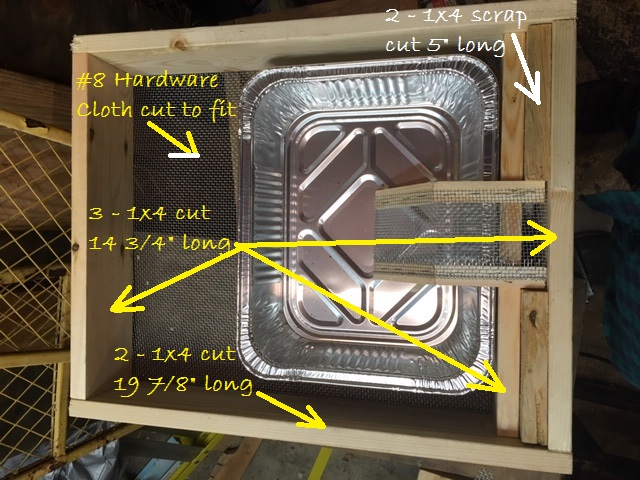 Now turn the feeder over and cut the hardware cloth out of the 3″ x 3/4″ hallow space so the bees can access the feeder. “Winter is Coming” and this coming Saturday will likely be my last chance to slip my feeders on before the temperatures drop into the 50’s. Tic-toc, tic-toc. I hope you find this blog helpful. Please leave a comment if you have any questions.